Explore the enchanting and little known island of Holbox: If mangroves, tropical vegetation, blue lapis lazuli waters and tranquil gorgeous beaches is your thing, then you’ll love Holbox. Pronounced Hole-Bosh, this laid back little piece of paradise is the perfect retreat far away from the crowd in Playa del Carmen or Cancun. To get there, you will need to drive from Playa del Carmen to Chiquila and catch a 30 mn ferry over to the island (round trip ticket is about $160 pesos). The total trip takes approximately 4 hours door to door.Once there, grab one of the golf buggy cars and scoot past colorful artsy murals of local thatched homes and local handicrafts stalls. The best thing to do on the island is absolutely nothing. The area was once a hideaway for pirates before becoming a fishermen island and is now an idyllic spot for people wanting to rest up and be off the grid for a little while. However, if you are the exploring kind, fear not! There is still a plethora of activities available. Explore the Yum Balam Reserve where you can observe flocks of pink corals flamingos in their natural habitat, swim in natural springs and enjoy the sound of silence whilst gazing at the turquoise waters. If you like marine wildlife, seize the opportunity to swim with majestic whale sharks from May to September. The whale sharks appreciate the plankton-rich water area and come breeding in its warm waters in summer. The real treasure Holbox has to offer however comes at night in the form of a bio luminescent cosmos. Indeed, when night falls, the phytoplankton presents in Holbox’s waters start emitting a bright blue light when agitated by the waves. This awe-inspiring unique phenomenon makes Holbox beaches a real magical night experience. If you are looking for island hopping, Holbox offers the option too. Hop onto the “The 3 island tour” where you’ll be able to explore 3 deserted paradise islands; Isla Pájaros, Yalahau and Isla Pasión. -Where to stay on Holbox? We recommend the comfortable and eco-friendly VILLAS FLAMINGOS. Furthest from the city center, although still on the main strip, from this beach hotel you can walk miles on the sandbar without seeing anyone (apart from the flocks of flamingos) and therefore have the beach to yourself. If you are the overworked type looking for some peace and quiet surrounded by beauty, then this is the place for you! The rooms are all very clean and comfortable and you can even indulge in a bit of a luxurious experience with their bungalow cielo option including a beach balcony, a jacuzzi and a massive outdoor shower! Paddleboards and Bikes can be rented for free. What else could you possibly want? – Bacalar, “the magical town”: Besides boasting one of the most beautiful lakes in the world with no less than 7 different shades of blue , the Bacalar region is a paradise for culture lovers. Indeed, if you love history, artifacts and spectacular Mayan sites, then you’ll have the best time in Bacalar. The town is one of the 111 pueblos Magicos or magical towns, the Mexican government has selected based on their unique traditions, rich folklore, natural beauty, arts and crafts and most importantly historical significance. These villages can be found among deserts, beaches, in valleys, on mountains, and hidden in dense jungles. All 31 Mexican states have one. The area around Bacalar is filled with Mayan ruins such as Kohunlich, Becan, Chicanna, Dzibanche and Chacchoben. They are all within a 2 hour drive from Bacalar and are well worth a day trip, especially the ancient site of Kohunlich. The Maya site is made up of sophisticated and elaborate structures and was settled by 200 BC. It is most known for its Temple of the Masks, flanked by huge and extremely well preserved humanized Stucco masks. The masks are part of a symbolic decoration system loaded with cosmic elements which shows the important of cosmos in the Maya culture. If you spend a couple of days in Bacalar roaming around town to visit Maya sites, you ought to visit the San Felipe Bacalar fort. The fort was built during the 18th century to avoid ransacking by the English, French and Dutch. From the fort you can learn more about the colonial times and Mayan culture whilst taking in the Lagoon’s fantastic views. Another spectacular Maya site is Dzibanche. The place is arguably one of the most beautiful Maya sites I have ever seen. When you set foot on the site, all you can see is dense tropical vegetation, but soon the massive shapes of ruined buildings appear like ghosts through the trees, the enchanting sound of tropical birds and squeaking monkeys escorting you along the way to the towering pyramids. Some of the best-preserved Maya woodcarvings were found on lintels here in 1927, and they are on display today. Plan to be here for around 2 hours – there’s a lot to see and you’ll enjoy the peaceful setting. Plan 2 or 3 days to visit all the sites mentioned above and allow for a relaxing day on the banks of the Bacalar lake after the exploring! If you love Maya history but hate overcrowded spots, Ek balam could be just the place for you. The Ek Balam ancient Maya site is only a 40 minute drive from the very touristy Chichen Itza site. It is much less known and therefore frequented which allows for a peaceful exploration. The site was once home to a very wealthy and powerful town. The town ceased to be a thriving city in 1000 BC. The site was first uncovered in 1889 but the real excavation work only started in 1987. Most of the city is still buried. Some structures are so spectacular than it seems impossible they could have been built without the use of modern tools. Quieter than most Cenotes in the area, this beautiful water hole offers big sunny open areas, beautiful clear water and a gorgeous island in the middle with shelters. The water is a bit cold at first but, hey, you’re an adventurer after all and you’ll feel invigorated after a few minutes. This Cenote is particularly interesting because it is less known and tours only take small groups (at the moment) to try and preserve the site. –Diving : If you love diving, Cozumel is a must go for you. It is very touristy but diving is exceptional there. You’ll be blessed with a healthy reef, loggerhead and green turtles, nurse sharks and also eagle rays. Shark Point in Playa Del Carmen is another great spot to consider especially if you want to see Bull sharks. from November to February, it is believed that they’re looking for quiet and fresh water stream coming from the Cenotes to nurse their young. If you’re looking for an unusual experience, try to dive in the Cenote Pit, 120 meters deep making it the deepest Cenote in Mexico. This pit named by the locals El Pit has been deemed as mind blowing by a lot of professional divers. Once you’ve hit the 30 meters mark, the surroundings have been described as surreal. We haven’t been there yet but the high number of fantastic reviews and praises the site has experienced over the years makes us want to book another ticket for Mexico asap and explore this gem! What about you? This is a favourite for adventure lovers trying to escape mass tourism. Picture this, lush and dense vegetation near the Belize border, far from the main cities’ hustle and bustle and all you can hear is the sound of the nearby river called Blue Creek. On the banks of the Blue Creek river, in this outpost of Belize stands a village called La Union: the perfect place to perform adventure activities like rappelling, kayaking, and trekking. Put your trainers on and head over to the spectacular local cenote called Crocodilo Dorado, “Golden Crocodile,” which unlike the rest of the cenotes of the Yucatan Peninsula, is located at the foot of a small mountain range, making it the best place in all of Quintana Roo for rappelling. The water is azure blue and the cliff stands high above it , at 70 meters above the ground. Would you dare? – LUUMA: Luuma is one of the best restaurants on Holbox. Both a bar and restaurant in a the gorgeous and romantic setting with candles and mood lighting, the place offers yummy food, great cocktails and cool music to enchanted visitors. For a mouth watering feast, order the croquetas de chaya or the tabla de queso. La Choza : This is the most amazing address to eat in Cozumel if you are after authentic traditional Mexican food without the frills. Located downtown, it has an incredible sense of Mayan culture. The bright and colorful yellow walls and wooden tables set the traditional Mexican vibe. The place is notorious for its chicken mole and ceviche. A must try when in Cozumel. Fernando’s 100% Agave in Mahahual: This adorable establishment is one of the best in Mahahual. After a day of exploring, what better than testing guacamole melting in your mouth like butter? You’ll certainly enjoy the complimentary shot of mango tequila as well as complimentary nachos. Everything is delicious on the menu from the shrimps to the quesadillas with arrachera and the portion are very generous. Perfect after a long day adventuring! Have we missed anything? 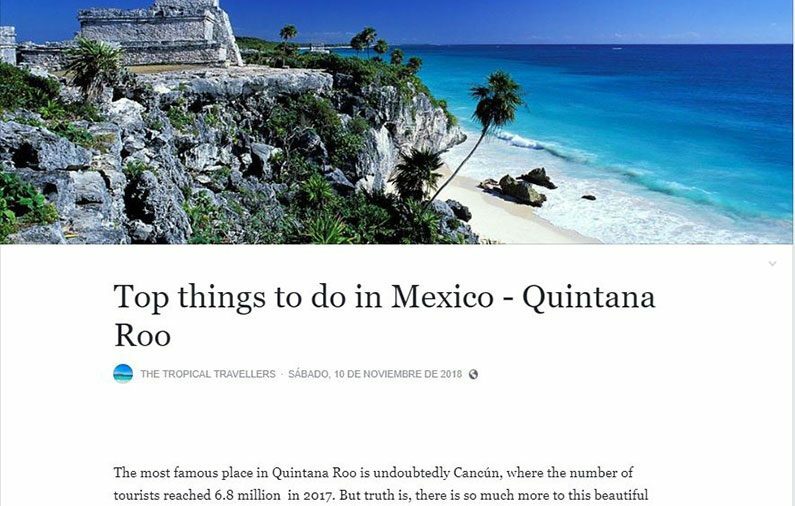 Can you recommend any other less traveled spot in Quintana Roo? We’d love to hear from you!